This recipe is a bit of a process but its completely worth it! It starts with the crunchy cookie topping. This part is simple and can be made a day in advance. A combination of butter, brown sugar, flour and ground black sesame is creamed together in a mixer. 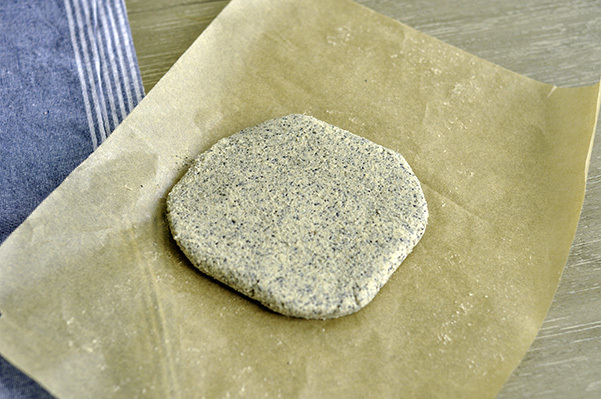 This "cookie" batter gets flattened into a disk, wrapped in plastic or parchment and placed in the fridge for at least an hour. Then comes the cream puff. There are variations on making a pate choux, but I found this recipe to be interesting since it used bread flour instead of AP flour. It starts my boiling water, milk and butter in a pot. Once it boils, add in all the flour and stir with a wooden spoon till combined. Continue cooking until the dough coats the bottom of the pan and the dough comes together into a ball. Place this dough into the bowl of a mixer with a paddle attachment and beat it for about a minute of cool down the dough. Then add in one egg at a time until you get a smooth, very, very sticky dough. It will look dodgy at first. the dough will separate into clumps as it tries to work in the eggs but keep going and in about 4 minutes it will come together. Pipe the dough onto a parchment lined baking sheet. I like piping them into a spiral starting from the outside and working my way in. This way once it bakes up you have a ready made hole for the filling! But be sure to make your spirals tight or else you get a flattish puff. Once piped, take your cookie dough out of the fridge and roll it out between two pieces of parchment paper to about 1/4". Using a circle cookie cutter, cut out rounds slightly smaller than your piped puffs and place these disks on top of your piped puffs. Bake these off at 375F for 35 minutes. They will look good enough to eat... but wait there's more...It's time to make the cream. Place two cups of milk in a large pot add in two Thai tea bags and allow to steep for about an hour or until the milk turns a bright orange. Heat the milk on low while you whisk together the egg mixture. Whisk the egg yolks with sugar, then sift in flour and cornstarch. Add in vanilla bean paste and a pinch of salt. Once combined, pour in 1/4 of the warm tea milk. Stir to temper the eggs then more the eggs into the milk and increase the heat to medium. Whisk while you bring the the liquid to a boil. It will continue to thicken so keep whisking to keep it smooth. Once it stick enough to create track marks, take it off the heat and add in the butter. Allow the cream to come to room temperature (or since I'm impatient, I place the bowl in a larger bowl of ice and whisk until it comes down in temperature) then add in more softened butter and you're ready to fill. Put the cream in a small piping bag or a zip top bag and fill via the hole in the bottom of your cream puff! Then try not to eat all of them in one sitting! The cream is only good for about 1 day or two, so eat these fast! There's honestly nothing better! 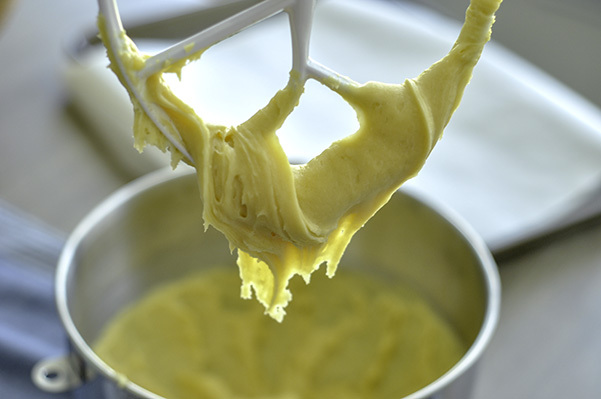 Make the cookie dough: In the bowl of a stand mixer fitted with the paddle attachment, cream the butter and brown sugar until light and fluffy, 4 to 5 minutes. Add the flour, ground black sesame and mix to combine. Form the dough into a disc 1-inch thick and wrap tightly in plastic wrap. Chill for at least 1 hour, and up to overnight. Make the pâte à choux: In a medium pot, heat the water, milk, butter, and salt over medium low heat. Bring to a full boil. Add the flour all at once, and cook, stirring constantly with a wooden spoon, over low heat. Cook until a slightly sticky paste forms—stir until the paste forms a ball around the spoon and there’s a film of starch on the bottom of the pot. Transfer the paste to the bowl of an electric mixer fitted with the paddle attachment. Mix on low speed for 30 seconds to 1 minute to help cool the paste. Whisk the eggs together in a liquid measuring cup. With the mixer running, add the eggs in a stream. Mix until fully incorporated, 3 to 4 minutes. Test the consistency of the batter. Remove the bowl and paddle from the mixer base. Dip the paddle into the dough and lift it up. The dough should form a V shape, eventually breaking away from the batter in the base of the bowl. If the dough is too stiff or pulls away too quickly, whisk together another egg and add gradually. Do the test again (see the article for more info)! Transfer the pâte à choux to a disposable pastry bag. You can either fit the bag with a large circle tip or just cut a 1/2- to 3/4-inch opening from the end of the bag. Hold the pastry bag straight up and down, perpendicular to the baking sheet. Begin applying even pressure to the pastry bag, letting the pâte à choux flow down onto the parchment. Continue applying pressure without moving the bag—the choux will flow out onto itself, creating a rounded mound. When you’ve reached the desired size, stop applying pressure to the bag gradually, then use a quick twist of your wrist will help you come away cleanly. When you’re finished piping, if there’s a noticeable ridge, tail, or spiky point on your choux, dip your finger in warm water and use it to gently smooth the dough. Roll out the chilled cookie dough between two sheets of parchment paper. As you roll, occasionally peel the top parchment away from the dough, then flip the dough over and peel away what was the bottom parchment as well. This keeps the dough from fully adhering to the parchment during rolling, and also makes it less likely that crinkles in the paper will leave lines on your dough. Roll out the dough to 1/4-inch thick. Use a round cookie cutter to cut it out. (Note: If you used a cookie cutter to trace guides on the parchment for your pâte à choux, you can use the same cutter to cut the rounds of dough.) Gently transfer each round to a piece of pâte à choux—no need to press it down or anything, just lay it gently on top. Preheat the oven to 375°F. 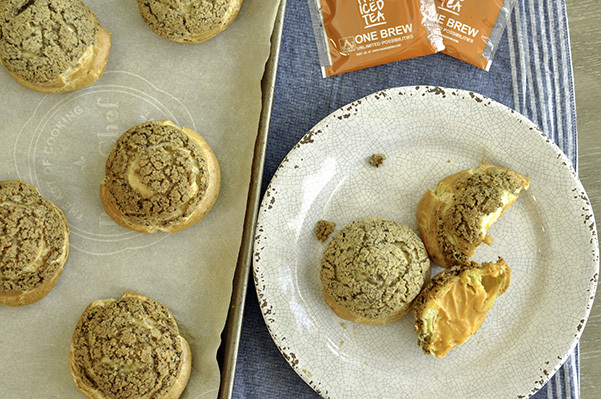 Bake the cream puffs until the choux is golden brown and the cookie topping is crackly and crisp, 35 to 40 minutes. Steep Thai tea bags in milk for 1 hour or until bright orange. Pour only ¼ of warm milk into and whisk to combine. Then pour the cream in the pan of the warm milk. Place the cooled cream into a piping bag, or a zip top bag and pipe into the bottom of each cream puff.